1. Don't pack much stuff. This was a recurring theme from lots of parents out there. One parent noted that on her trip to Australia with her 18 month old she "brought way too much stuff for her entertainment - big waste. Travel is OVER (not under) stimulating." Another mom suggested pipe cleaners as great entertainment. What a wonderful idea! They are light and easy to pack. 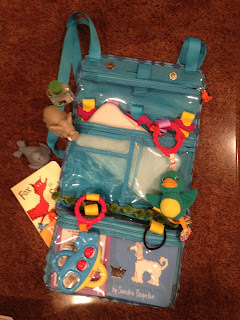 My response: I immediately pared down what I am bringing with me -- particularly the toys. I was already packing light, but reduced that by half again. I'll report back on how that goes! They are all stashed in the travel organizer I made, too. Check it out! This is the travel organizer I made. 2. Bribe your fellow passengers. Another mom noted that on trips between the US and Europe, she "would bring a box of Godivas for the people sitting near us. Right before take off, I'd introduce myself and apologize in advance for any inconvenience caused by my baby. Helped tremendously!" My response: while I wish that wasn't necessary, I know that there are lots of people who get uptight when they see a baby or a toddler sitting nearby. So, I'll be packing chocolates! 3. Nurse on take-off and landing. Bambino and I have flown about every eight weeks since he was born, so this is one we have down. 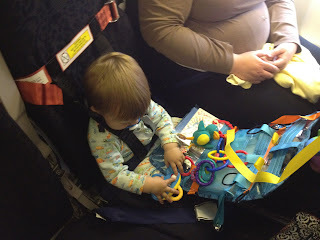 He has been fussy sometimes waiting for it while we sit on the tarmac or taxi out, but nursing him as we take off has meant that his little ears don't hurt -- which, frankly, everyone on the plane appreciates. Not nursing? A bottle works just as well and a pacifier will do in a pinch. It's the sucking action that makes the difference. 4. Find your inner peace. Not always easy, but as one of my dear friends wrote, "Your baby acts as an amplifier of your state of mind. Find your peace and trust you'll be up to any challenge the journey will bring. Take small setbacks in stride and find gladness of heart." My response: I'm working on my deep breathing exercises. 5. Hydrate -- both of you! This is really important for all travelers, but it is easy to forget that toddlers need to drink more than usual in flight, too. My response: I'm packing sippy cups for the plane -- one for milk and one for water. We'll keep him drinking as much as possible. 6. The iPhone is king. Several moms recommended charging up the iPhone and filling it with videos for the flight. One noted, too, that dimming the screen all the way down is better for your toddler's eyes and helps save battery time. My response: Bambino particularly loves videos of babies, so I'm loading mine with home movies to watch. I'm not sure how he will do with the headphones, but I'll bet he loves them by the end of the flight. 7. Bring lots of hand wipes. 8. Let other people interact with the toddler. Several moms and dads noted that toddlers are so interested in other people, so the other travelers will be ample entertainment for large chunks of the trip. My response: There's a fine line between being entertainment and bothering other passengers, but we will happily walk that line. The chocolates (see #2) should help. 9. Remember: it will all end. Another mom wrote, "You and your baby will both have a phase or two of temporary unhappiness, discomfort and maybe even exhaustion. Emphasis on temporary. This, too, shall pass!" My response: Eek. I am a traveler who hates the plane trip and always get to a point where I am cramped, crabby, and a little crazy. Remembering that it WILL end can be hard. I'm going to have to work even harder on this one! 10. Don't worry about the jet lag. Apply the same rules for the toddler that you do for yourself -- hydration, staying awake as much as possible, and walking -- will help make the switch faster and less painful. My response: This is one of the things I have been worried about the most. I like my sleep, and Bambino does, too. 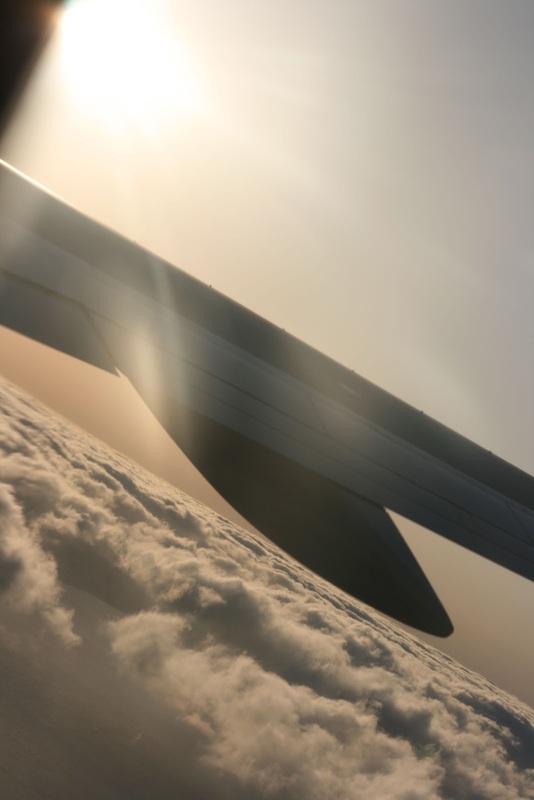 Check out my tips for minimizing jet lag for adults. I'll be working on most of those principles with Bambino, too. So, we are off soon! I'll let you know how things go once we are on the other side. Ciao!